Brian Clark's recent post "Jazz and the Art of Improvisational Blogging" over at Copyblogger asks the question "Can jazz musicians really teach you a thing or two about effective blogging?" I've been reading Brian's blog for its well-articulated thoughts on how to be a more effective blogger and writer. It was no different with this post as his use of jazz and its artists to illustrate something about effective blogging hit a chord (pun intended). In addition to the jazz hook, Brian's post made me realize it had been awhile since I took some time to reflect a bit on what I do here in Jazz@Rochester. Brian's use of quotes by jazz musicians also made me look up a few of my own for illuminating other places where jazz and blogging may intersect. Jazz musicians riff off the rest of the band, and the vibe of the audience, in real time. Good bloggers riff off of relevant parts of the blogosphere, and the vibe of the audience, also in real time. Things only break down when someone forgets who the real audience is. ...even an innovative artist who is ahead of his time needs to get some people into the club first. Play them a song they want to hear, get them on your side, and then take them happily to a place they had no idea they wanted to go. I think that keeping this in mind is particularly important for a blogger who, as here, focuses and promotes a local music scene. I try to keep a focus on the fact that what I am really trying to do here is promoting the live jazz music scene here in Rochester, NY. I need to provide people who are interested in the jazz scene here, or who just drop in because they're looking for something to do on a Saturday night, what they want and need—a mostly comprehensive and accurate source for information on the live jazz scene here. I also want to take the blog and my readers beyond that local focus and those trips will be guided by my own interests and instincts. Of course, I also want this blog to be successful and to grow the audience. I have a couple of additional "riffs" off other jazz quotes I found out there. Imitate, assimilate, and innovate. Clark Terry. Clark Terry's observation says a lot about what bloggers try to do. While you're blogging you sometimes find yourself imitating other bloggers or blogs in your approach or writing. You often assimilate the content of posts that have struck you or information aggregated from numerous sources and then mold your own post and, hopefully, innovate something else out of all that content. That's what I'm trying to do here. The blogging software and ease in publishing to the web make it possible to take Hines' advice and "shine the tops" when I make a mistake on Jazz@Rochester or just engage in some sloppy writing (which happens more than this editor would like to admit). I could simply make it go away or clean it up, repost, and only those who have already seen the post will even know. However, remembering the audience, it is important with some posts that I lift up my feet and show those holes as it is the only way that my readers will know there was a mistake they may want to pay attention to. That's why you'll see me using strikeouts when a gig is canceled or calling attention to new gigs on the listings post with an "[added]." Sure from time to time I'm just embarrassed at a result and I'll do a bit of a rewrite "on the sly." However, even if I do that, I know. The fact is even if I tape up the holes, the water (or in our case today, snow) will get my socks wet. This post has ended up on much longer than is advisable, but there it is. I just let it take me where it wanted to go. If you got to here before going elsewhere, I commend you. Seriously, I don't hear enough from the people reading Jazz@Rochester. I'd like to hear more about what you'd like to see in these pages so I can try to keep it focused on what matters to you. Leave a comment (all you have to do is click on the link at the bottom of the post to get started). In addition to listening to jazz (no . . . really), I listen to an eclectic range of music, including alt country, singer-songwriters and folk, blues, 80s alternative, classical, electronica and dance, world music (particularly from Africa), and hip hop (well, old-school hip hop). I still listen to vinyl from time-to-time as I still have over 700 LPs. I ran a record store back in the early 1980s while a student at the University of Chicago and worked for about a year at the flagship store for the old Chicago record store chain Rose Records (which alas is no more), where I ran the cutouts section. A good portion of my record collection came out of this experience, including an almost complete set of Coltrane's LPs on Impulse! were bought at the latter after the label was bought by MCA and the old Impulse! pressings were cut out. Now if I could only find a turntable that works . . . . I wish I played any instrument well enough to improvise. Of course, then I'd have to practice . . . . a lot. This tag showed up another issue I'm finding with this blog . . . I don't have enough of a network. Unfortunately, Jason has tagged some of the folks that I would have tagged already and I'm not sure there are enough left in my network who want to be "tagged" (and if they don't wish to carry it on, I understand and won't be hurt . . . really). So, if you don't mind Tom (disclosure. . . I also write on this blog), George and Peter—tag you're it ! Do with it what you want. I'm giving my friend Annie a pass this time as I see she's already done this meme at least once. Now I need to look into expanding my network a bit, eh? Yvonne has tagged me again with a meme about the songs that make your heart sing (actually, she tagged me back on June 19th, but somehow it passed by me that I'd been touched; not following the old traffic as closely in the past week). As you might expect, my choice is something in the jazz vein, although there are quite a few songs in other genres that pull at the ole heart strings. 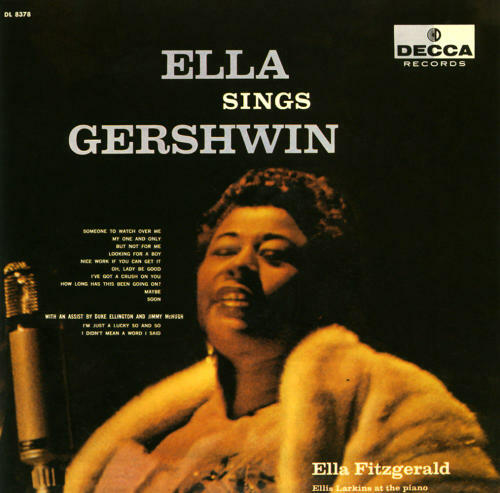 Music and Lyrics by George and Ira Gershwin. © 1926 WB Music Corp. (renewed). Music has the power to bring you joy, ease your pain, help you cry through heartache and see you to the other side. Sometimes the same moment in the same piece of music . . . can bring me to the height of heart-busting joy or bring me to a puddle of tears depending on where I am in the continuum of my emotions. Tracy's aim is to tell you about about the musicians, music and gigs she is seeing in hopes of getting more people out to see the talented musicians that we grow right here in Rochester. We share that as well. Check her out... Oh, and thanks for the link to Jazz@Rochester, Tracy. I blog because I've always been about making connections between people and information that they find of interest or need to better their lives. That's one of my biggest strengths at the day job and a big part of what drove me into the law and publishing. The development of blogs and other social media has fascinated me as it gave us mere mortals tools and the opportunity to publish to the world, and share the connections we make with others. As a result of blogging, I realize that one of the reasons I blog is the connections it helps me make WITH people, real people in the real world, whom I likely never would have met, much less formed a relationship. Those who have read these pages for a while have first hand knowledge of these connections. If I didn't blog, I would never had much of an opportunity to meet Jimmie Highsmith Jr. and Wycliffe Gordon, much less see them record tracks for Jimmie's new album, other than going up after a gig to lamely say "great set!" 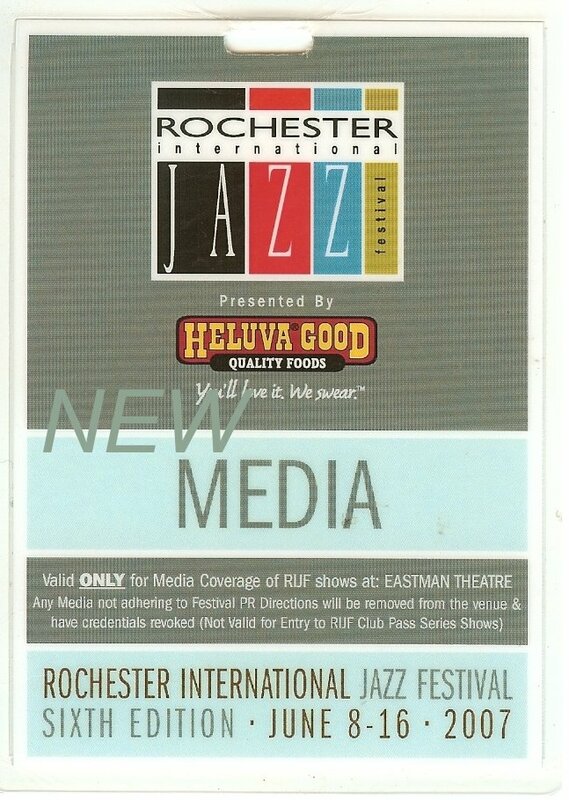 If I didn't blog, I wouldn't have met Seth and Ken, my Rochester International Jazz Festival blogging compadres (and others the links to whom are or will be revealed in these pages). Also, I wouldn't know a number of those in the jazz music scene here. I blog because I find this tool and reading the blogs of others a wonderful way to find information that feeds my wide universe of interests, of which jazz is only one, and to expand my mind in ways I couldn't have imagined. By reading blogs that interest me and see who they are reading, I'm building a network of reliable sources of information that sustain my work and my everyday life. I blog because it gives me a platform to highlight my skills and build an understanding of how blogs can meet the needs of clients and potential clients of the new business in which my wife and I are engaged, as well as the business of our partners. I blog because it allows me to share my love of jazz and live music, and to use the skills I have to promote it here in Rochester, a city that I'm growing more attached to since arriving in 2002 from Chicago. It allows me to share information I find out on the Internet relating to jazz with people here and throughout the world (I get a number of hits from around and outside the US).